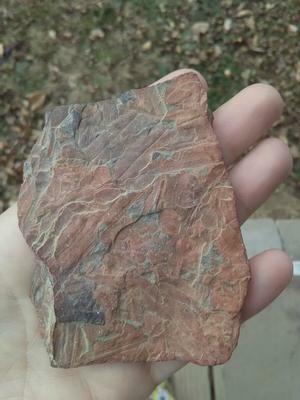 I Showed my friend the fossil I send y'all last night and she got this out of her sewing kit to share, she found it in the woods as a kid could not remember if it was Florida or Tennessee, told me a story about how her step father tossed it out once and she nicked it back from the trash bin, she told me it was bigger before all that happen, should would love to have any information on what it could be. Comments for feathers or leafs? Tracy City Tn "Tracy Elementary School"
Monteagle Tn "Monteagle Elementary School"
I can also add more photos if you need them. This looks like it has some leaves in it. 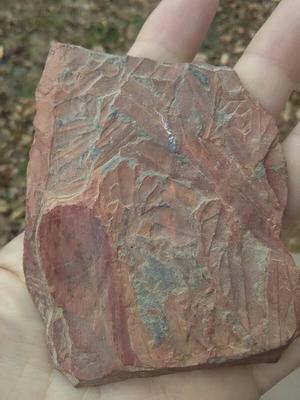 It is difficult to give more detailed info without knowing where the rock came from. Thanks for your submission.